Arrive Delhi, meet & assistance at the airport & straight drive to Samode. Arrive Samode & transfer to the hotel. Night stay at Samode. Morning after breakfast proceed for city sightseeing tour of Samode. At Samode, you may have an enjoying camel ride over the sand dunes or explore the heritage character of the village. Evening at leisure watching cultural performances. 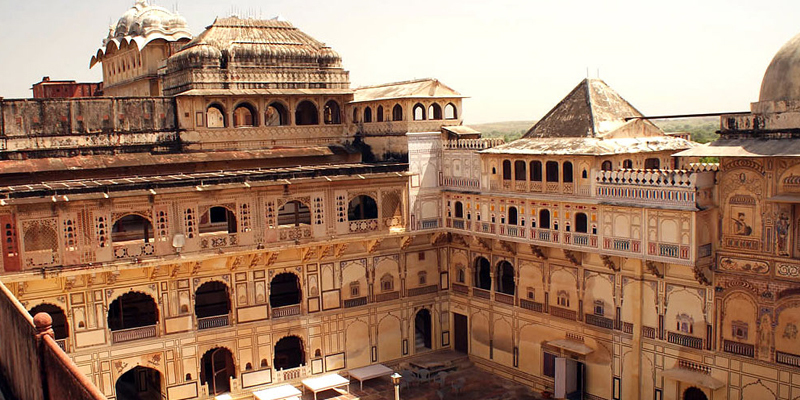 The Samode Palace displays the excellence of Rajasthani architecture. It is built in that pattern of an open courtyard with rooms leading off the arched corridor that runs along all the four sides of building. The painstakingly carved Sultan Mahal reflects an artist’s Zest for creativity and excellence. Durbar Hall is painted with Ornate floral motifis and colored delicately with vegetable pigments carries a charm of its own. Night stay at Samode. Morning after breakfast and drive to Nawalgarh. Arrive Nawalgarh and check-in at the hotel. Later visit Nawalgarh, the seat of the Poddar families. Nawalgarh is known for the high quality of its paintings, even in the richly frescoed Shekhawati area its Poddar School has some excellent old work. Nawalgarh was founded in 1737 by Thakur Nawal Singh, a warrior- statesman. Night stay in Nawalgarh. Morning after breakfast and drive to Khimsar. Arrive Khimsar and check-in at the hotel. Later proceed for city sightseeing tour of Khimsar. Khimsar is steeped in history- founded 2500 years ago by the Jain Saint Mahaveer, this is the starting point of the great Indian Desert tours. The founder of the castle, which was built in mid 15th century, was Prince Karamsi, son of Jodhpur and very close to other places of interest like Osian and Nagaur. Well managed Khimsar Fort provides for the visitors with all modern amenities- 50 luxuriously furnished rooms, theme dinners, variety of continental and Indian meals as well as traditional Rajasthani are available. Enjoy Jeep Safari. Night stay at Khimsar. Morning after breakfast and drive to Jaisalmer. Arrive Jaisalmer and check-in at the hotel. Rest of the day at leisure. Night stay at Jaisalmer. Morning after breakfast and drive to Pokhran. Arrive Pokhran and check-in at the hotel. Later visit Pokhran, Ramdevra is home to the temple of Baba Ramdevji. Devotees from all over places visit the temple all round the year. Ramdevra Fair is held here in the months of August and February and is attended by devotees in large numbers from all over India. Night stay at Pokhran. Morning after breakfast and drive to Jodhpur. Arrive Jodhpur and check-in at the hotel. Later proceed for city sightseeing tour of Prince Jodha founded city Jodhpur - the stronghold of the fierce Rathore clan, in 1459. Visit the Mehrangarh Fort, situated on a low sandstone hill. Within the fort, visit Moti Mahal and Phool Mahal. Also visit Jaswant Thada, an imposing marble cenotaph, built in memory of Maharaja Jaswant Singh II around 1899 and Umaid Public gardens. Night stay at the Jodhpur. Morning after breakfast drive to Rohet en-route visit Mandore, the former capital of Maharajas of Marwar was abandoned for security concerns regarding the Mehrangarh Fort. Its extensive Mandore Garden, however still makes it a popular attraction with its high rock terrace. Mandore Garden has the cenotaphs of Jodhpur’s former rulers. Unlike the chhatri shaped cenotaphs, these cenotaphs are built like traditional Hindu temples. Four storeys high with carved pillars, they are all made in red sandstone. The cenotaphs are surrounded by beautiful gardens. Visit the cenotaph of Maharani that is set on a rocky outcrop over the hill that provides a beautiful view of the surroundings. After visit continue drive to Rohet. Arrive Rohet and check-in at the hotel. Night stay at Rohet. Morning after breakfast check-out from the hotel and proceed for city sightseeing tour of Rohet, a 16th century Rajput village. The village was gifted to Thakur Dalpat Pal Singh by Maharaja of Jodhpur as a reward for his bravery in the battle. The afternoon is scheduled for jeep safari in and around Rohet village. After visit continue drive to Daspan. Arrive Daspan and check-in at the hotel. Night stay at Daspan. Morning after breakfast visit to Daspan village where the fertile fields grow bountiful crops and the village is known for its embroidered shoes. 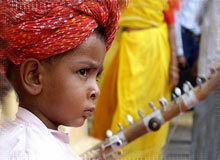 Explore the village and meet the families that make bows and arrows in the Bhil style. Night stay at Daspan. Morning after breakfast and drive to Ranakpur on the way visit Sirohi. Shree Pavapuri temple is situated in Sirohi district of Rajasthan. Shree Pavapuri temple considered as a Tirth place for Jain. After visiting continue drive to Ranakpur. Arrive Ranakpur and check-in at the hotel. Night stay at Ranakpur. Morning after breakfast check-out from the hotel and proceed for city sightseeing tour of Ranakpur. The world famous Jain Temple Ranakpur. The exceptionally beautiful Ranakpur complex, is one of the largest and most important Jain temple in India. The main temple is the Chaumukha Temple, or Four Faced Temple, dedicated to Adhinath. Built in 1439, this huge, superbly crafted and well-kept marble temple has 29 halls supported by 1444 pillars, no two alike. After sightseeing continue drive to Devigarh. Arrive Devigarh and check-in at the hotel. Night stay at Devigarh. After breakfast check-out from the hotel and visit Devigarh. The village has four 14th Century Jain temples, which were the inspiration for the famous temples of Dilwara near Mount Abu. These temples in Delwara are a must visit on your tour of Devi Garh. 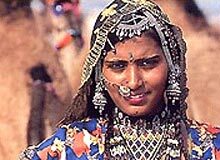 The village is about 450 years old and home to various communities comprising of Jhala's (Rajputs), Patel's, Gameti's (Bhil tribe) Muslim's and Jain's. After visiting continue drive to Udaipur. Arrive Devigarh and check-in at the hotel. Night stay at Udaipur. Morning after breakfast proceed for city sightseeing tour of Udaipur visiting The city is built in 1559 A.D. by Maharaja Udai Singh and has been described as the most romantic spot on the continent of India by Col. James Todd. Visit the City Palace museum, the Jagdish temple, Sahelion Ki Bari (Queen's resort for their friends) Bhartiya Lok Kala Mandir (Folk art museum) and the Pratap Memorial. Night stay at Udaipur. Morning after breakfast and drive to Dungarpur. Arrive Dungarpur and check-in at the hotel. Later visit Dungarpur. The full day is meant for exploring the villages in the tribal area. There you can find a world which far behind the world of modernization and development. They are strictly holding their customs and traditions amidst the fast world. You can go to their houses, can talk with them, and even can take a picture with them. Later move for a visit to Juna Mahal, the Badal Mahal, Rajmata Devendra Kunvar State Museum and Cultural Centre and the Government Archaeological Museum. Evening can be spent with the tribals enjoying their traditional dances and cultural programs. Night stay at Dungarpur. After breakfast and drive to Dungarpur on the way visit Chittorgarh. The magnificent 7th century Chittorgarh Fort. On way to the fort you can see two chhatris or memorials of Jaimal and Kalla marking the spots where they fell while defending the fort during the siege of 1568. Other attractions inside the fort include Vijay Stambh (Tower of Victory) and the Kirti Stambh (Tower of Fame). The ruins of Rana Kumbha's Palace, Padmini's Palace, Kalika Mata Temple, Government Museum. After visit continue drive to Bijaipur. Arrive Bijaipur and check-in at the hotel. Night stay at Bijaipur. Morning After breakfast check-out from the hotel and proceed for city sightseeing tour of Bijaipur .Visit nearby forts, picnic by the lakeside or explore the village. It is well situated for visiting Chittorgarh, Menal. After sightseeing continue drive to Kota. Arrive Kota and check-in at the hotel. Night stay in Kota. Morning after breakfast check-out from the hotel and visit in Kota. On the eastern banks of the Chambal River, near the Kota Barrage, is located the City Fort and Palace. Within the city palace is the museum which houses a good collection of artifacts. The Kishore Sagar Tank built in 1346 and the Jagmandir Palace located on a small island at the centre of this tank is other sources of tourist attraction. The Brij Vilas Palace Museum, Chambal Gardens and the Chhatar Bilas Gardens. After visiting continue drive to Bundi. Arrive Bundi and check-in at hotel. Night stay at Bundi. Morning after breakfast check-out from the hotel and visit Bundi. visit Taragarh Fort built in 1354 A.D., Bundi Palace, Chhattar Mahal, Ratan Daulat, Chaitrashala, Nawal Sagar lake, Raniji-ki-Baori (Step well), Sukh Mahal, Phool Sagar and eighty four pillared cenotaph. After visiting continue drive to Pachewar. Arrive Pachewar and check-in at the hotel. Night stay in Pachewar. Morning after breakfast check-out from the hotel and visit Pachewar. A small village located at a drive of just 25 minutes from Dudu, south to the city of Jaipur on the Jaipur Ajmer highway, Pachewar is famous for cenotaphs, blue pottery kiln, metal toy makers and interesting surroundings. It is a lively place that was once ruled by Khangarot Rajputs, a sub clan of Kachhawaha Rajputs. After visiting continue drive to Jaipur. Arrive Jaipur and check-in at the hotel. Night stay in Jaipur. Morning after breakfast drive to Bharatpur en-route visit Karauli. A quaint township founded in 1348. You can experience a serene rural environment here apart from the City Palace and Kaila Devi Temple. After visiting continue drive to Bharatpur. Arrive Bharatpur and check-in at the hotel. Night stay at Bharatpur. Morning after breakfast check-out from the hotel and proceed for city sightseeing tour of Bharatpur. Bharatpur Bird Sanctuary on rickshaws. The most Spectacular water- bird Sanctuary features nesting indigenous water- birds and migratory birds. From October till December, the indigenous water- birds nest around the lake, from December on the migratory Geese, Duck and Cranes are the main feature of the bird sanctuary. After sightseeing continue drive to Agra. Arrive Agra & check-in at the hotel. Later Night stay in Agra. Morning after breakfast proceed for city sightseeing tour of Agra visiting the world famous Taj Mahal built by the Mughal Emperor Shahjehan in 1630 for his queen Mumtaz Mahal to enshrine her mortal remains. Also visit Agra Fort, containing the Pearl Mosque - the rusty and majestic red- sandstone fort of Agra stands on the banks of the river Yamuna and Emperor Akbar started the construction in 1566. At the Diwan-I-Khas (hall of private audience) where marble pavilions with floral inlays lend an ethereal ambience, the Emperor sat on his gem-studded peacock Throne and met foreign ambassadors and rulers of friendly kingdoms. After sightseeing continue drive to Delhi. Arrive Delhi and check-in at the hotel. Night stay at Delhi.